Number Manager lets you view and control all telephone numbers (also known as DDIs or DIDs) available at your site. 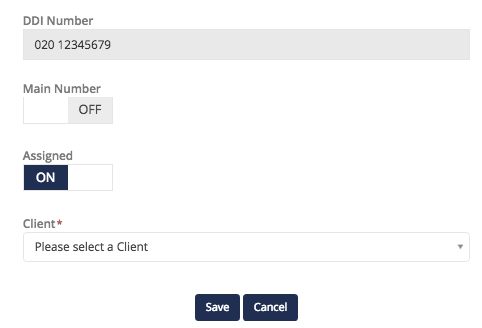 This allows you to add specific numbers to your Clients if desired, move numbers from one Client to another and choose if any specific numbers function as a Main Number. 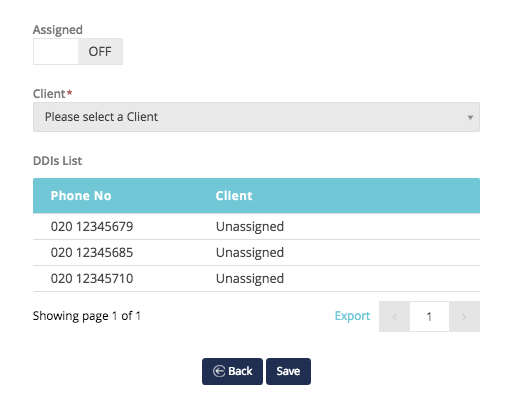 Connect will always automatically assign telephone numbers to your Clients when you add any Voice Service, however Number Manager gives you greater control of number assignment if ever required. This section hosts all numbers at your site with their current status. The Ext. Status column will give you details on the configuration of each number and will let you filter accordingly. Active: This number is assigned to a Client and activated. It is currently a live, functioning telephone number. Before you can make any changes to this number, it will need to be deactivated from the Clients Telephone Manager. Assigned/Reserved: The number is assigned to a Client but it is not activated. This number lives under a Clients Telephone Manager but is not currently being used. Pending: The user has requested this number to be activated or deactivated. Connect is waiting for this task to be completed. When a Client has been decommissioned, or if they have cancelled their telephone services, their telephone numbers will move into a cooling off phase. This prevents the telephone numbers from being immediately assigned to another Client at your site. Once the cool down has expired, the numbers are automatically ready to be assigned to another Client. If you have any numbers you wish to move out of the cooling off phase prematurely, please contact essensys. This will reflect if any of the telephone numbers have been manually locked by essensys staff. These will not be moved or changed without the assistance of essensys staff. The number is not assigned to any Client and is available to be assigned. This shows if the number is setup to function as a Main Number. This can be toggled by selecting the telephone number and using the Edit menu. Learn more about Main Numbers here. You can select multiple numbers at once. The 'Select all' tick box will select all in the view. When moving to the next page of the table, the selected numbers will persist. Toggle Assigned status on and off. Not assigned will remove it from all Clients and place back into the Number Manager. Assigning will allow you to select a Client. Select Client. This will place the number into their Telephone Manager ready for activation. To edit these elements, contact the essensys support team. This will allow you to bulk assign and un-assign numbers to clients. Each Client can have a maximum of one Main Number. 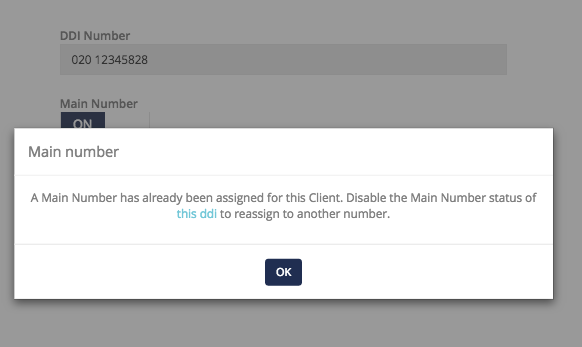 You will see a validation message while attempting to enable or assign a 'Main Number' for a Client that already has one.